Q. Can you help me with drum editing in Cubase 5? I have to edit eight tracks of drums on six songs. Generally there are four to six takes. I'm using Cubase 5 and would like to know the easiest way to edit the tracks. Obviously I'm using the 'lanes fixed' option for the kick, snare, hi-hat and overheads, but it will take forever to solo each take. Any ideas on how I can make the process easier? Any help would be greatly appreciated. In Cubase 6.5, Steinberg greatly improved their comping tools, making it much easier to edit together the best sections of a multi-take, multitrack recording. 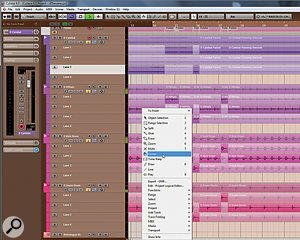 SOS Reviews Editor Matt Houghton replies: In all honesty, I found this sort of work to be a royal pain in the posterior in Cubase 5, so the first thing I'll recommend is that if you're planning to do this sort of work a lot, it would be well worth you upgrading to the latest version of Cubase (v6.5 at the time of writing, but check our Cubase 7 review on page 20! ), assuming your computer and OS are up to the task. Among many other features that have been added or refined, the multitrack, multitake editing functions have been overhauled specifically in 6.5 to make the task you describe much easier, and along the way they've added more useful tools. Read our reviews of Cubase 6 (/sos/apr11/articles/cubase-6.htm) and Cubase 6.5 (/sos/jun12/articles/cubase-6-5.htm) and you'll soon see what I mean! If you prefer to stay within Cubase 5, the best I can suggest is a workaround. 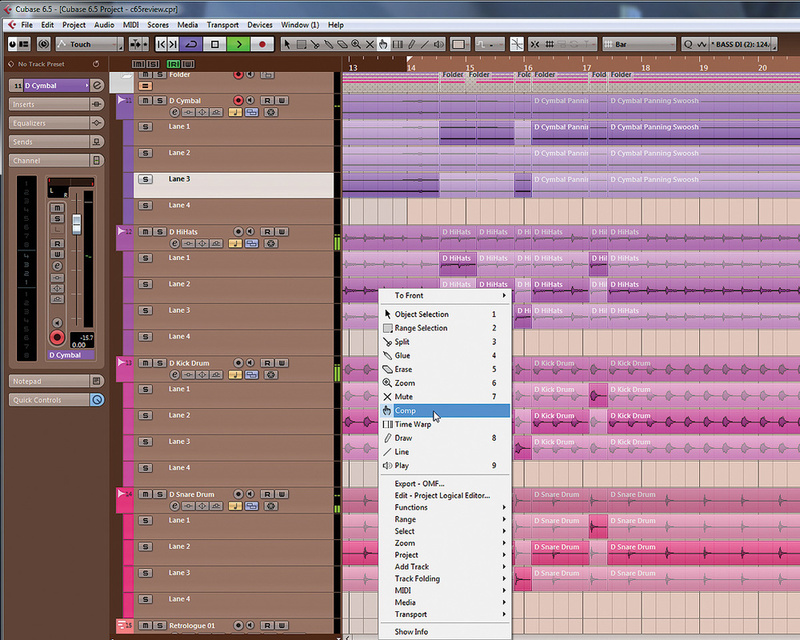 When making edits to multitrack drums, you'll want to select all tracks at the same time for each take. There's no sense just punching in a different section of the snare mic, for example, as any spill from other instruments will cause problems with the other tracks, and you'll still have the original snare in the other mics, potentially causing phase-relationship problems with the punched-in part. Personally, I'd create a folder track to house the multiple tracks for each take, so that you have four to six folders — one for each take — and eight tracks within each folder. The reasons for this are twofold. Firstly, it enables you to use the solo button on each folder to instantly audition the desired take; secondly, it allows you to use scissors on the folder to edit all tracks for a take in one action, and to use the mute tool to silence the other takes at that point. When you then come to comping your take you can have a master folder with eight tracks on to which you can drag and drop the relevant takes. As I said, it's an onerous process, and although there are other ways to skin this cat, they're equally burdensome in my opinion. So if you're doing any amount of multitrack, multi-take editing, it would be well worth updating to the latest version of Cubase (and of course you'll get many more features into the bargain).